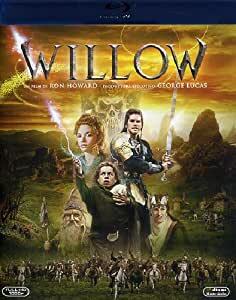 willow viene ricordato come il primo lungometraggio in cui sono stati applicati effetti di morphing digitale,[ willow, contadino di un piccolo villaggio di nelwin (simili agli hobbit) aspira a diventare uno stregone. un giorno trova una bambina daikin (cioe' umana) abbandonata sul fiume. la bimba e' una principessa predestinata a sconfiggere la malvagia strega regina bavmorda, che in precedenza aveva fatto uccidere la madre e la nutrice della bambina per scampare alla profezia. 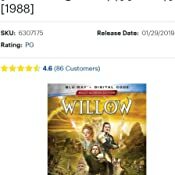 willow, dal cuore buono, deve portare la bambina dal suo popolo ma incontrera' mille peripezie. con l'aiuto del guerriero madmartigan, di due folletti e dell'anziana strega fin raziel (intrappolata in forma animale) willow affrontera' e sconfiggera' la strega. 5.0 out of 5 starsA movie with heart!!! It's so sad to me when I reference this movie and the current few generations have no idea what I am talking about. EPIC MOVIE. If someone doesn't like this movie, I would seriously question their priorities in life. Loved as a kid. Loved as an older kid. Still love as an old adult. Never gets old. One of my all-time favorites! 5.0 out of 5 starsGreat movie.... need Amazon Video! Wish this would come out on Amazon Video!!! 5.0 out of 5 starsPleasantly Surprised! The transfer of the original movie format to the Korean Import DVD is very good in both video and audio quality, 5.1 digital. The story in the movie is a simple, predictable fairytale to be appreciated as it is. The movie is spoken in English. It has the option of English or Korean subtitles. The English subtitles are done well. If an adult can appreciate this type of story, it is suitable for all ages. Beware of a most ugly two-headed dragon that makes the original Godzilla, in the movie Gojira, look like a wicked cool monster. 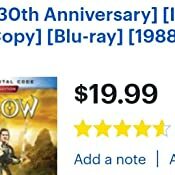 Versus higher cost discs, the KOREAN IMPORT (All regions) DVD is worth it for under $25 of a heretofore hard to find movie of an early Ron Howard/ George Lucas production. 5.0 out of 5 starsMost underrated fanatasy film of all time. This was my favorite as a kid. The music, action, story-- everything about it fueled my young imagination and, in many ways, shaped my tastes going forward. But as an adult I wondered how I would view it now. Would it hold the same appeal now as it did to a much younger me? The answer is a resounding YES! Not only did it bring a surge of nostalgia, but I noticed aspects of the film as an artform that I had never paid attention to as a child, and I have a renewed appreciation for the film, the actors, and especially for Ron Howard. Fantastic movie. Glad it finally made it to digital format! Poor quality video. Not production quality cover or DVD printing. Obvious bootleg. Hard to find this DVD, even harder to find it in 720 or better. At least now you know what you're buying. A lovely film, on any level. Great for kids to understand the differences among people, as well as the good vs evil stuff. Ron Howard knows how to make a good film, and his attention to detail is impressive. 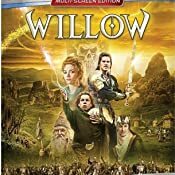 "Willow" wasn't a huge hit when released, but awards committees rewarded its effects and sets 'n stuff. Who cares? It's a great ride, and Warwick Davis is a commanding lead character. Val Kilmer and Joanne Whalley handle the romance end of things, and the wonderful Jean Marsh is the meanest of evil villains. I don't have kids, but I'm pleased to have this Blu in my collection. My inner child is so entertained. BTW: Kilmer and Whalley met and married because of "Willow". Of course I I am a fan of this movie. I would have given it 5 Stars other than the price is a little Hefty. Was the cheapest DVD I could find for this particular movie. but still a little high compared to other 80s movies with about the same amount of "cult" following. But i had to show this to my 7 year old and hopefully he'll look back and it'll bring him fond memories of watching it with his dad just like it has for myself. 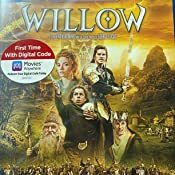 I never heard of Willow before until I was searching forgotten fantasy films. Upon getting it and watching it, I can understand it being an underrated film and getting a cult following. The story is pretty dark, where an evil sorceress tries going after newborns for a prophecy regarding her downfall. 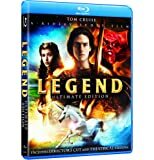 A dwarf to-be sorcerer takes in the a child in hiding and goes on a quest of returning her home to safety in a neighboring kingdom. In a nutshell, the plot is pretty simple, and the witch queen is not seen that much. The main cast tries their best and some are stronger than others. Warwick Davis and Val Kilmer have the brightest chemistry with their charm over each others personalities. The special effects are pretty good though at times it can be comedic like looking at the witches hounds that hunt down the duo. They are basic dogs with a boar-possum costume. They don’t look intimidating. Now considering the purchase of Lucasfilm from Disney, the reamergence of films George Lucas did or produced, this will grow in following. 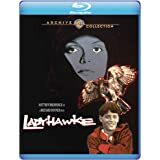 If you like fantasy and are investigating one of the rarer films under the radar give this film a try. May not be the best or the worst, but it does stand the test of time.